Registration will open at 7:45 AM and will close at 9:30 AM. The pre-registration fee is $20, and registration at the door is $30. You may pay online with via PayPal. You may also pay with a credit card at the BPOU Convention. Click here to pay online. 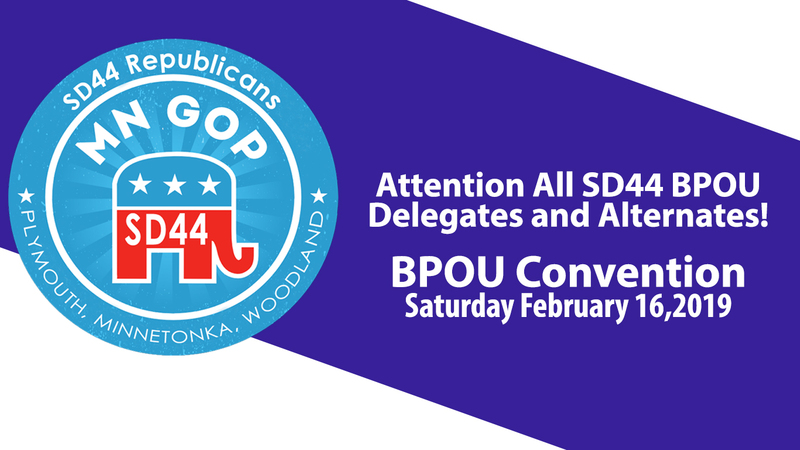 Candidates interested in being considered for Senate District Leadership or as Delegates or Alternates to the State Central Convention should email jcrowe0602@yahoo.com by 5:00 PM on Thursday February 7, 2019. Issued in the City of Plymouth, Minnesota, this 15th day of January, 2019.